When you hear the abbreviation CMS, you probably think about Drupal, Joomla, and even WordPress. However, there are alternatives to those heavy hitters if you want something more lightweight or flexible. If you’re look a simple administration interface, or integrate custom application code into the site, then I suggest exploring Fuel CMS. In this two-part series I’ll discuss some concepts of Fuel CMS. In this part I’ll talk about its installation and how to set up views. In the second part I’ll talk about writing a Fuel CMS module. 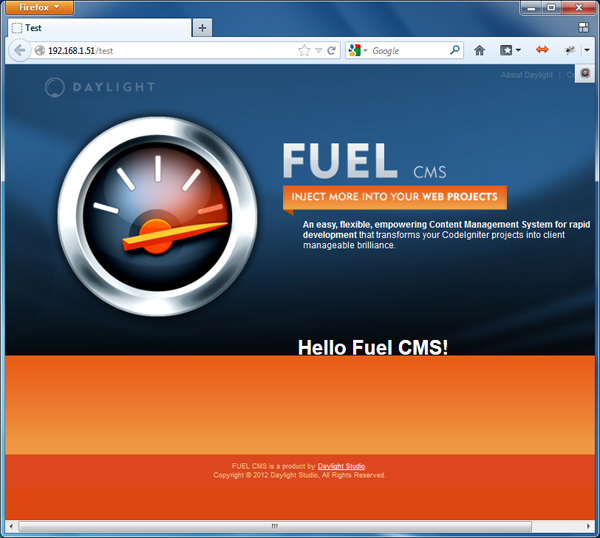 FUEL CMS is a modular-based hybrid of a framework and a content management system. It’s developed on the popular CodeIgniter PHP web framework and allows you to create your models, views and controllers like normal and only use the CMS part when and if you need it. The administration dashboard is indeed simple and easy to understand, which is good if you’re handing the project off to a less tech-saavy customer after development. However, where in other CMS you can build a complete website without writing any code, with Fuel CMS this is not the case. You’ll have to do things yourself following the way of CodeIgniter. If you don’t like writing code, then this may not be the right CMS for you. The documentation suggests that you should have some basic knowledge of CodeIgniter before starting, but this was my first experience with CodeIgnither and I was able to build a working site with relative ease, so experience with any MVC framework may be sufficient depending on your goals. 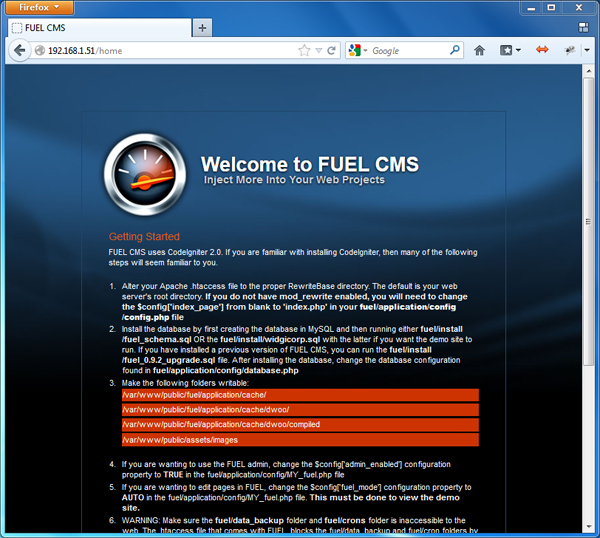 Development of Fuel CMS started around November 2010 and the current stable version is 0.92. Version 1.0 is currently beta. The installation process for Fuel CMS isn’t like the other content management systems; there’s no fancy installer, only an introduction page with an explanation of various settings you need to specify in your configuration. You have to execute the database installation scripts yourself. But we are developers after all, so this isn’t something that’s insurmountable. You can either use Git to clone the latest version of the code or you can download a copy as a ZIP archive. Regardless, place the code in the root of your htdocs directory. When you visit http://localhost (or whatever your development address may be) you should see a page listing the steps you need to perform before you can start developing your site. Follow the instructions to configure Apache, create the database, and change directory permissions. Fuel CMS provides some .htaccess files to help you set up the rewrite rules and get everything running smoothly. 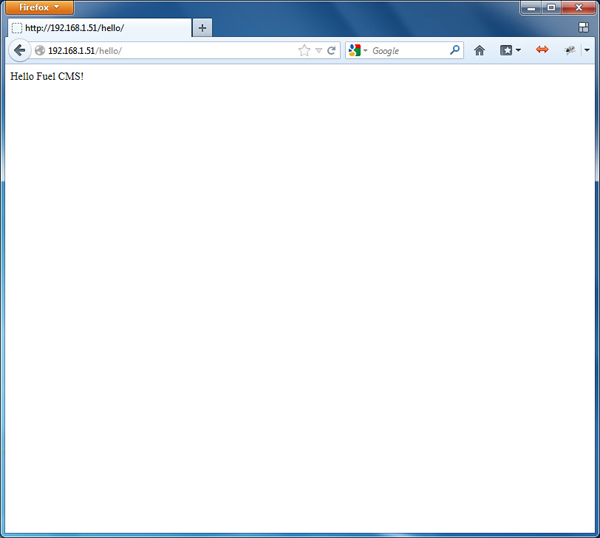 This is where I ran into some problems though because I’m using Nginx. The configuration files can be found under fuel/application/config. Fuel CMS can be thoroughly customized, but I’ll stick to the most important settings for right now. In the database.php file, enter your database information in the corresponding fields. If your server doesn’t support mod_rewrite, in the config.php file change the index_page option to “index.php”. Now you’re ready to log into the admin panel at http://localhost/fuel. Log in into the dashboard with the default username and password, both “admin”. Once you’re logged logged in, you’ll be prompted to change that password. You should do this now or else you’ll get an annoying reminder popup with every action you do. So here you are: in the middle you see some information, the latest news and a link to the documentation. The menu is located to the left. In Fuel CMS, everything is divided in modules: the site module, the blog module, several tool modules, and the user modules. The first thing you might want to do is create a page. This is a straightforward process similar to most other content management systems. 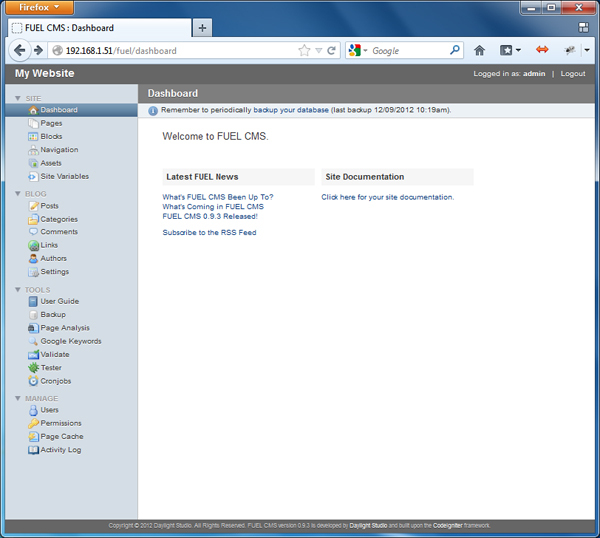 In the left menu, click on Pages and then click the Create button. Enter a location (this is the URL fragment, so no spaces! ), page title, and your content, then click Save. You can visit the page by going to http://localhost/index.php/test. You’ll see the text you entered, but with the same design of the installation page. The page you just created uses the layout of the installation page, so go back to editing your page (go to Pages in the menu and then click the page title). Note the Layout setting which is currently set “main”. Change that to “none”, save, and then check the page again. You will now see a blank page with your text. The echo fuel_var('body') line retrieves the content you specified for the page from the database and displays it. 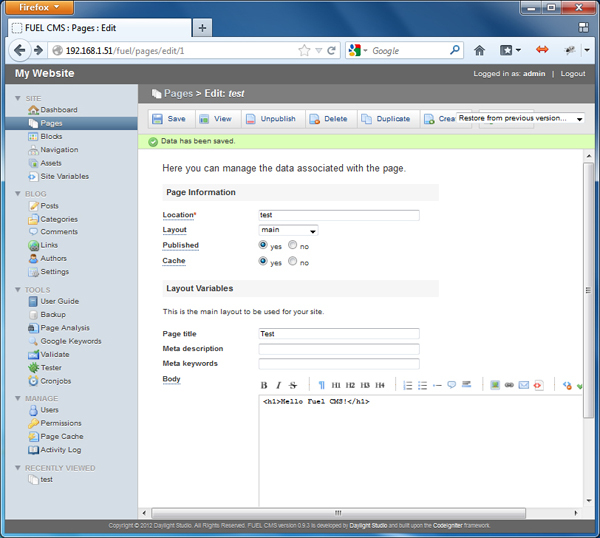 The example above uses layouts to put together basic editable pages. But as I spoke about earlier, you can also create custom view files. For example, if you have a page that functions differently from the the rest of them on your site, then you’ll need to write a custom view. This part of the process actually has more to do with CodeIgniter than with Fuel CMS itself. We’ve defined a controller class Hello with the method index() which is called when you request the page. We load the fuel_page named “hello” which refers to hello.php in the views directory. Now let’s add some variables which are used by the page. Variables are most commonly used to create and map input fields in the Dashboard to variables in the template. The global variables are in fuel/application/views/_variables/global.php, and we can override them by creating the file hello.php. This overrides the layout variable to use the “none” layout, just as we did before with the test page. Go to http://localhost/hello and you should see the ‘Hello Fuel CMS!’ message. instead of writing a native foreach loop with output statements. We’ve discussed installing Fuel CMS and creating pages and views. With this basic knowledge, if we wanted to make a site with multiple pages and a custom layout, it shouldn’t be difficult to do. In the next article I’ll explain how set up your own modules. Stay tuned!